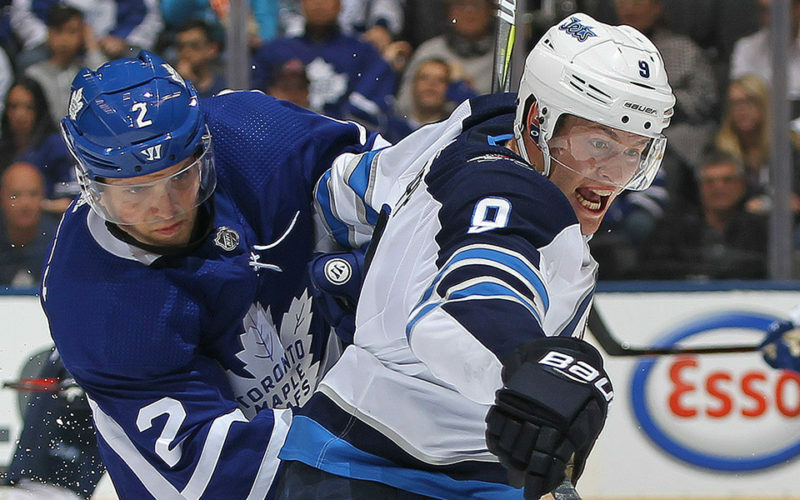 The Winnipeg Jets continue a four-game road trip tonight against the Toronto Maple Leafs…Winnipeg began the trip with a 2-1 victory over the Detroit Red Wings last night…After tonight’s game, the Jets head to Finland to play the Florida Panthers in Helsinki on Nov. 1 and 2. Tonight is the first of 10 back-to-back sets the Jets have this season…Last season, the Jets went 4-3-2 in the first game of back-to-backs and 4-4-1 in the second game…Winnipeg’s next back-to-back is in Helsinki against Florida…Nineteen of Winnipeg’s 20 games in back-to-back sets this season are on the road. Tonight is the third of five consecutive games for the Jets against an Eastern Conference team…The Jets are 2-1-0 against Eastern Conference teams this season…Winnipeg went 19-7-6 against the Eastern Conference last season, including a 10-3-3 record versus the Atlantic Division and 9-4-3 record against the Metropolitan Division…Blake Wheeler led the Jets with 37 points (10G, 27A) in 31 games against the Eastern Conference, which was tied for fourth among Western Conference players last season…Goaltender Connor Hellebuyck went 15-3-5 versus the East. The Jets have scored 18 goals in third periods this season, which is the most in the NHL…Winnipeg has allowed 13 third period goals, making it an NHL-high 31 combined third period goals in games the Jets have played this season…Winnipeg’s third period scoring has been spread out with 12 different players scoring the 18 goals…The Jets have scored in the third period in five consecutive games…Six of Winnipeg’s seven game-winning goals this season have been scored in the third period or overtime…Bryan Little leads the Jets with three third period goals, two of which have been game-winning goals. The Jets have scored a power play goal in seven consecutive games, going 8-for-23 (34.8%)…Winnipeg is 30.3% on the power play this season, which is fifth in the NHL…Mark Scheifele and Patrik Laine lead the Jets with three power play goals this season, while Kyle Connor (2) is the only other member of the Jets to have more than one power play goal. Dustin Byfuglien’s game-winning goal in the third period last night was his 500th career point…According to NHL PR, Byfuglien is 14th player in NHL history that was drafted in the eighth round or later to reach 500 career points and the only active player in that group…His game-winner was the 36th of his career, which is most amongst active defenceman. Goaltender Laurent Brossoit turned away 27 of 28 shots last night for his third consecutive win to start the season…Aside from being 3-0, Brossoit has a 1.67 goals-against average and .957 save percentage…This is the first time in his career that he’s won three consecutive starts and is the first Jets goaltender since relocation to win his first three starts. Bryan Little won 11-of-15 faceoffs last night for a 73.3% faceoff winning percentage…It’s just the third time this season a Jets centreman has taken 10 faceoffs or more and won more than 70%…The other two occurrences were done by Adam Lowry…As a team, the Jets have won more than 50% of the faceoffs in four of their last five games. Blake Wheeler had an assist last night to extend his point streak to five games (1G, 5A), which is the longest scoring streak by a member of the Jets this season…Mark Scheifele (3G, 4A) and Kyle Connor (1G, 4A) are on four-game point streaks.